Colgan will be missing some key players due to injury, but should be a favorite at home against Leon-Bluestem. The Panthers are led by senior quarterback Cade Simmons who has thrown for 518 yards and five touchdowns, while adding 573 yards rushing with seven scores. Classmate Kash Marietta has added 560 yards on the ground and seven more touchdowns. Bluestem will counter with junior Nicholas Laidler who has passed for 941 yards and five scores, but has been picked off 14 times. Senior Hunter Clift has 219 passing yards, 363 rushing yards, and 419 receiving yards with 10 combined touchdowns. Yates Center finished third in District 1 with a 7-6 victory over Uniontown. The Wildcats other win came 42-22 over Northeast-Arma. Yates Center’s strength is in the speed of their backfield which features seniors Thayne Smith and Nolan Jones, and freshman Kendrick Jones. Hillsboro has enjoyed a breakout season from senior Jorge Hanschu after he missed last season due to injury. Hanschu has passed for 1,412 yards and 16 touchdowns, while rushing for 646 yards and nine touchdowns. Brooks Gardner has been solid in the backfield with 616 yards and 10 touchdowns. Northern Heights suffered through turnovers and a sluggish offense in last week’s 16-7 loss to Wabaunsee. The Wildcats scored on a touchdown pass from Marcus Waters to Tee Preisner to take an early lead, but couldn’t produce any more points. Now they must stop the vaunted ground game of Jackson Heights. The Cobras, one of the top teams in the classification all year, secured a district title with a 47-8 win over Lyndon. Cooper Williams rushed for 302 yards and six touchdowns in the victory for Jackson Heights. The Cobras have an experienced offensive line that should be able to handle a Wildcat defense that has surrendered nearly 27 points per game. Valley Heights will be excited to be a part of the bracket this fall after missing the playoffs in a loaded district last season despite a 7-2 record. The Mustangs will host a Lyndon program that is still seek answers to replacing one of the top players in school history in Dexton Swinehart who graduated last year. Junior Shawn Hinck leads the Tigers with 460 rush yards and four scores, while freshman Darian Massey has passed for more than 500 yards but has been intercepted 12 times. Valley Heights is led by junior Cole Coggins who has rushed for 1,162 yards and 19 scores after an all-state season a year ago in which he rushed for 1,288 yards and 19 scores. Uniontown and Olpe have already met earlier this season. In that meeting, the Olpe Eagles came out on top 48-6 after building a 41-0 halftime lead. Olpe features a strong backfield in Blaine Hinrichs and Kynden Robert. Those backs join Colby Hoelting and Camden Hoelting for one of the top groups of skill players in the classification. Uniontown’s lone win came 52-12 over Northeast-Arma back in Week 3. The matchup marks two teams with much different pasts, 2018 records and strength of schedules. An alum leads both squads. Marion’s Shaun Craft, a veteran assistant, took over after Grant Thierolf retired from football after he coached 30 years with the Warriors. Marion, which also took big graduation losses, mainly quarterback Jack Schneider, has dropped back from 8-3 to 2-6. The Warriors have played the No. 1 hardest strength of schedule in 1A. Marion lost 18-14 to Hillsboro, 26-0 to Hutchinson Trinity and 50-38 at Douglass, all teams that have two or fewer losses. Pleasanton, led by coach Dustin Johnson, transitioned back up to the 11-man ranks and has improved its win total for a fourth straight year. Pleasanton has captured its most victories since 2008 and is looking for its second 11-man playoff victory since 1979. The Three Rivers League champion, the Blu-Jays have faced the second-easiest SOS. Brothers Kasen and Kaden McKee have led an offense that has averaged 30 points a game. Blake Pohlmeier, a transfer from Washburn Rural, is the Blu-Jays leading rusher. Centralia has won six straight games after an 0-2 start that included close losses to Class 2A playoff qualifiers Rossville and Riley County. The Panthers then picked up qualify wins over St. Mary’s Colgan (20-0), Troy (36-22), and Valley Heights (49-22). Junior Kamble Haverkamp leads the Centralia offense with more than 1,200 rushing yards and 16 touchdowns. He and Isaac Gore make up one of the top backfield in the classification. The Panthers, ranked No. 2 to begin the season, are led by a strong offensive line that features Derek VanDorn and tight end Dagen Steinlage. Jefferson County North was hit heavy by graduation after last year’s 10-1 team. The Chargers have two wins over Oskaloosa and Wabaunsee – teams with a combined record of 1-15. Wabaunsee picked up its only win of the season last week in defeating Northern Heights, 16-7. It was also the first victory for new Charger coach Jess Rutledge. Wabaunsee will not hit the road to take on Troy. The Trojans are literally a few plays away from being undefeated. Troy has lost two games by one point each. The Trojans lost to Christ Prep, 20-19, and Jackson Heights, 8-7. Those two close losses were sandwiched around a 36-22 loss to Centralia in which the Trojans led late in the game. In the Mid-Continent League matchup, Smith Center, the defending 2-1A state champion and ranked first in 1A, is the substantial favorite against Oakley, a team it defeated 42-0 earlier this fall. Smith Center has started to roll against the No. 7 SOS and has outscored teams, 289-68, and has the No. 2-ranked defense. The Redmen have an experienced line with Austin Hobelmann and Joel Montgomery, and a stable of backs with Ethan Peterson, Hesston Maxwell and Colby Benoit. Oakley has a two-win improvement under second-year coach Jeff Hennick. The Plainsmen have lost 17 straight in Mid-Continent League play. Smith Center is 10-0 all-time against Oakley with all the matchups coming since 2003, according to Kansas Football History. Likely one of the more even first round 1A matchups, both teams are relatively close in scoring offense and defense. Sacred Heart has scored 140 points and permitted 186, while Ellis is at 165 points scored and 230 allowed. The Knights have played the No. 6 SOS in the classification, while Ellis is at 21. Sacred Heart has already had a one-win improvement under second-year coach Garrett Galanski. Ellis went 3-6 last fall. Both squads have significantly improved their defense. Sacred Heart permitted 374 points a game in ’17, Ellis 312. Veteran quarterback David Anderson has started since his freshman year for the Knights, though was knocked out of the game two weeks ago versus Ell-Saline. Seniors Charlie Skidmore and Trace Leners also are key players. Ellis has two victories against rival La Crosse, including one last week that clinched the home-field advantage this week. Senior Cade Lewis has emerged as a playmaker with 117 carries for 591 yards and five rushing scores, all team-highs. He also has a Railer-best 12 catches. These two teams have not played in at least 14 years. The Cardinals received a first-round bye because they won District 7, and adjoining District 8 has just three teams. Sedgwick has captured 28 straight district contests and nine straight undefeated district crowns dating back to 2011. Sedgwick leads the classification with 359 total points scored and has only a loss to Ell-Saline. Senior quarterback Hooper Schroeder and senior running back Colton Smith lead the offense. Schroeder has passed for 1,853 yards, fifth-best in Kansas and leading 1A. Smith has rushed for 801 yards. Kale Schroeder has 603 receiving yards, while Mason Lacey has 443 receiving yards. In a matchup of two Hi-Plains League foes, Meade is actually the higher ranked team by the overall numbers despite having the worse record. The Buffs have scored 205 points and allowed 209 against the No. 11 SOS. Syracuse has scored and permitted 144 versus the No. 28 SOS. Prep Power Index ranks Meade four spots higher. A victory clinches Syracuse’s first winning season since a 5-4 mark in 2005. Syracuse has heavily relied on the running game behind more than 550 yards from senior Edgar Gonzalez and already has enjoyed a one-win improvement from last fall. Meade has four players between 332 and 553 yards, led by senior Jarret Stapleton (team-high 11 rushing scores). Meade is 7-0 against Syracuse since 2010, including a 27-7 win in ‘17. Meade has seen its win total drop for the fourth straight season, and barring a big turnaround, will have the program’s first losing record since 2005. Plainville won 38-6 at Republic County in Week 5 and will be heavily favored in this matchup. Last year, the Cardinals defeated the Buffs, 50-6, in the regular season. Two years ago, Plainville beat Republic County, 58-28, in the regular season and then 49-0 in the playoffs. The postseason defeat started a current 18-game losing streak for the Buffs. Plainville has outscored teams 260-91 and is one of nine 1A teams to permit less than 100 points this fall. Cardinal junior quarterback Jordan Finnesy has completed 74 of 137 passes for 1,230 yards with a 15/5 TD/INT ratio. He has 108 carries for 595 yards and five rushing TDs, and junior Jared Casey has 95 rushes for 503 yards and 10 scores. Casey leads with 61 tackles and 11 TFLs. Senior Tanner Copeland has been one of the state’s top kickers with 33 of 34 extra points and five field goals. La Crosse opened 2-1 but has battled low numbers, injuries and few seniors to a 1-4 stretch. Ell-Saline is part of a deep pool of 1A contenders with a 259-92 overall margin against the fifth-hardest SOS. Ell-Saline lost to Smith Center in the final seconds, fell 8-6 to Hutchinson Trinity and is the only team to beat Sedgwick. Senior quarterback Nick Davenport is one of the state’s top players. Ell-Saline’s standout skill players include Sawyer Kramer and Treyton Peterson. For La Crosse, freshman Colby Stull leads with 512 rushing yards. Junior quarterback Hunter Morgan has 16 TDs accounted for, though didn’t play last week. In a rematch of Hi-Plains League teams, Elkhart defeated Sublette, 68-28 in Week 3, and along with Olpe, are the two 1A undefeated teams left. Senior quarterback Lane Whisennand has 647 passing yards with an 11/2 TD/INT ratio and has rushed for 1,313 yards and 19 scores. Seniors Elian Prieto and Javier Gomez have combined for 26 catches for 10 scores. Elkhart has played the weakest strength of schedule in the classification but is the only team to defeat one-loss Cimarron. 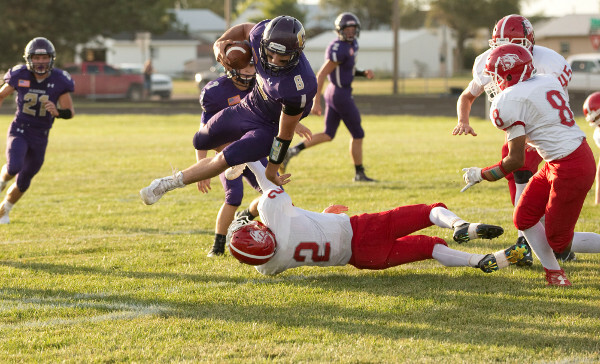 Sublette has lost 31 straight contests. Both teams have former alums as head coaches. Inman has enjoyed a big turnaround after a winless season last fall with coach Lance Sawyer. Junior running back Matt Ramey has exceeded 1,000 rushing yards behind a talented offensive line. In a rarity, Inman has a winning record but has been outscored for the season with 238 points scored and 246 allowed. Stanton County coach Bret Kendrick is in his first year of his second stint as head coach. The Trojans have scored 101 points and permitted 255. Stanton County has one of the state’s longest trips with a 238-mile route to Inman, just north of Hutchinson.